Confirm that your moisture barrier bags and desiccants have done their job by adding a Humidity Indicator Card (HIC) to each package. 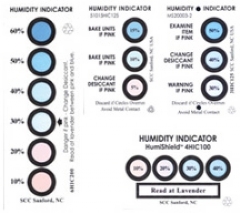 Humidity Indicator Cards (HIC's) are printed with moisture sensitive spots which respond to various levels of humidity with a visible color change from blue to pink. HIC's are placed inside vacuum sealed (dry packed) moisture barrier bags to monitor the interior humidity conditions of the package, and will help determine whether the components are dry enough for solder reflow. 4 cards are available that meet certain standards. 3HIC – 3 spot 30-40-50%, 125 cards per can. 3LHIC – 3 spot 5-10-15%, 125 cards per can. 4HIC – 4 spot, 10-20-30-40%, 100 cards per can. 6HIC – 6 spot, 10-20-30-40-50-60%,200 cards per can.